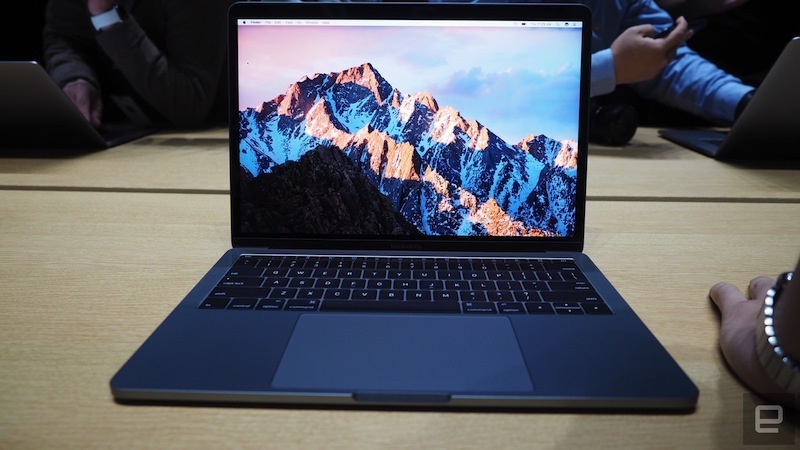 With pre-orders for the new MacBook Pro up today, and a launch expected within the next two to three weeks, Apple has given a number of journalists access to the 13-inch and 15-inch devices so they can share their thoughts with anyone who is interested in the new flagship MacBook Pro line. MacRumors has already rounded up a collection of opinions regarding the newest feature on the MacBook Pro -- the Touch Bar -- so this roundup will be focused on other areas. Namely, topics covered include the keyboard, trackpad, screen, and overall weight and feel of the device. Opinions on the keyboard appear to differ depending on whether or not the user is acclimated to the 2015 MacBook's Butterfly Enclosure keyboard, but otherwise the new MacBook Pro is getting positive initial reactions to its design, particularly in its ability to pack in powerful specs in such a lightweight enclosure. Many of those who got a chance to touch the new MacBook Pros of course first interacted with the keyboard, and The Verge ended up liking it, while noting that it's essentially the same as the one introduced on the Retina MacBook in 2015, which might cause problems with anyone who hasn't owned one of those MacBooks. 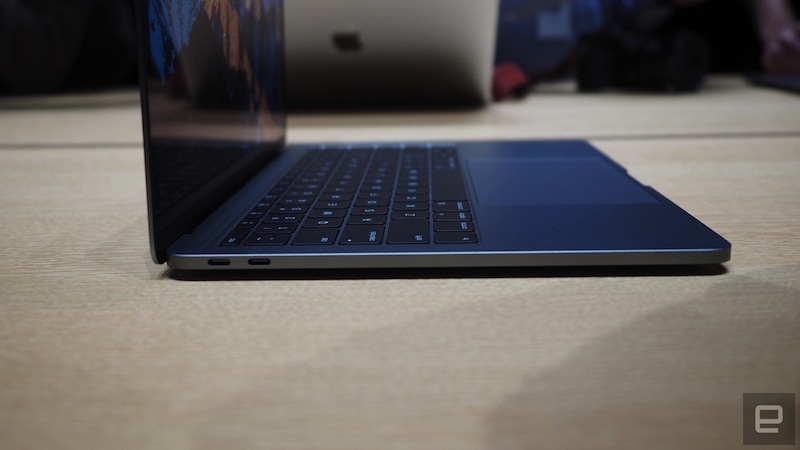 It also said that the trackpad is "absolutely massive." The keyboard is almost identical to the Butterfly keyboard found on the tiny MacBook. That’s going to cause some people to grind their teeth, but I think it’s great and easy to type on — and I do think the keys might have sightly better travel, but don’t hold me to that. In any case, I expect that this will be a sore spot for some people, but my level of sympathy isn't as high as it ought to be, because I think this keyboard is great. The Trackpad is absolutely massive, so much so that Apple had better make sure it has its palm-rejection software perfect, because your palms are going to be resting on this thing all the time. Forbes looked particularly at the weight of the MacBook Pro, and came away impressed with the device's form factor and heft, even calling the 15-inch model "a reasonable weight for people on the go." 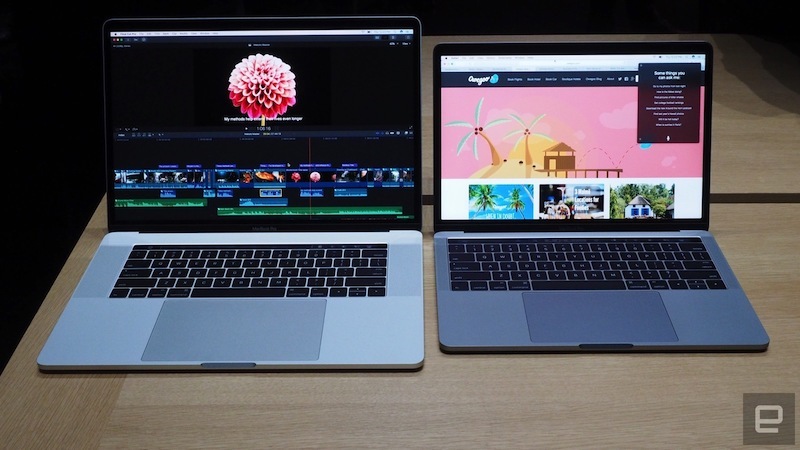 The site was able to handle both 13-inch and 15-inch versions of the MacBook Pro and was particularly pleased with the smaller laptop due to its 3 pound weight and more svelte design. As a road warrior and a 13-inch MacBook Air user, I was most interested in that model and pleased to learn that it’s the same weight (3 pounds) and a bit smaller form factor. Even the 15-inch, at 4 pounds, is a reasonable weight for people on the go. I was able to handle both models and could easily see myself carrying around the 13-inch model as I go about my day or walk from booth to booth at a large trade show like CES. Macworld delved deeper into the ports that the MacBook Pro offers, including the 3.5mm headphone jack (located on the right of each MacBook) that some feared might be eliminated following its removal on the iPhone 7 and iPhone 7 Plus. With the new models, Apple has included four total Thunderbolt 3 ports, two located on each side of the MacBook Pro (besides the Touch Bar-lacking $1,499 tier, which has just two Thunderbolt 3 ports). While Macworld admitted that adapters will inevitably be required for some tasks (with no proper USB-A input, an iPhone can't be charged or synced on the MacBook Pro), the move towards a more flexible input standard is "appreciated." As Apple demoed during the event, one Thunderbolt 3 port can connect a MacBook Pro to a 5K display and even charge it at the same time, and there are many other dynamic instances that users will be able to take advantage of thanks to the new ports on the MacBook Pro. Engadget was particularly impressed by the screen on the new MacBook Pro models, calling it "stunning" when in person and "a noticeable upgrade" from the previous generation of MacBook Pros. The site specifically mentioned that warmer colors in red and yellow boost image quality, and overall colors "really are richer and more vibrant." Engadget concluded its hands-on preview with one of the more superlative opinions on the new MacBook Pro, calling the device "an engineering marvel" that feels very solid in the hand and has beautiful finishes in Silver and Space Gray. Thanks to the added bonus that the 13-inch version weighs "even less than a MacBook Air," the site said that the 2-3 week shipping estimate will be a hard wait after pre-ordering. Aside from the Touch Strip, the laptop itself is an engineering marvel. It feels super solid, like a solid slab of aluminum, and I'm particularly enamored with the space gray finish. It's remarkable that Apple managed to cram fully fledged MBP internals into a chassis that weighs even less than a MacBook Air -- I held my Air in one hand and the new 13-inch Pro in the other, and I couldn't tell a difference between them. The 15-inch model is a bit heavier, of course, but it's still a relatively svelte machine for how powerful it is. And I can't discuss the hardware without mentioning the new screen. The wider color gamut it provides isn't something that most civilians need, but it is a noticeable upgrade when you see the difference side to side. Colors really are richer and more vibrant, particularly with warmer colors: reds and yellows in particular. For anyone interested, Apple's new MacBook Pro is available for pre-order today, with the 13-inch model starting at $1,799 and the 13-inch model starting at $2,399, and both versions are said to begin shipping in the next 2-3 weeks. Apple has also introduced a second 13-inch MacBook Pro sans Touch Bar for $1,499, which is shipping today. For more hands-on coverage, check out our roundup of opinions on the Touch Bar. Apple removes the 3.5mm jack from the iPhone 7 forcing the use of wireless or the Lightning port connected headphones (or the use of some stupid Lighting to 3.5mm converter). So now consumers drink the Apple Kook-Aid go out and purchase Lighting connected headphones and the arrogant Apple clowns release the new MacBook WITH a 3.5mm audio jack and NO Lighting connector. When asked about removing the 3.5mm jack, Phil Schiller has been quoted saying “the company can't justify the continued use of an 'ancient' single-use port”, and it took “courage” to abandon the 3.5mm jack. Isn’t this lovely, Apple just finished telling everyone that the 3.5mm jack is a horrible, outdated, dinosaur technology and we all should run out and purchase wireless or Lighting connected headphones. Thanks for the inconsistency Apple. Are you now going to say it took “courage” to leave the 3.5mm jack in the MacBook but you omitted the Lighting port because that’s now obsolete? At this point I would have been happier had they kept everything else the same and just upgraded the internals for the same price. There's nothing marvellous about it when it renders all your peripherals obsolete (you cannot even connect your own iPhone lol), with marginal upgrades, and your balance in account kaput. Sorry, but Apple is losing us Mac users one Pro at a time. The MacBook Pro has no port to charge your iPhone. Additionally there is no lightning port for you to listen to headphones that are compatible with an iPhone 7. Therefore, if you own an iPhone or iPad, I suggest getting a 13" MacBook Air instead. You'll save a lot of money. If you need pro-level power, I suggest a desktop. I'm afraid that Apple don't offer a laptop or desktop that is compatible with lightning headphones, so if you own an iPhone 7 or 7+, you may need to think twice before buying a Mac, and conversely, if you own or want to buy an Apple laptop or desktop, bear in mind that you will not be able to use lightning headphones, which is what the iPhone 7 and 7+ supports, so you may need to think twice before buying an iPhone 7 or 7+. If only Apple had included a USB port and a lightning port on their new computers, then this problem wouldn't have arisen. Microsoft win. Surface studio goes 1 light year ahead... Wait. Apple don't even have iMac to sell? Engineering marvels don't come cheap apparently. DDR3 RAM though, in late 2016 when everyone else is adopting DDR4? And a mid-range mobile GPU? Apple have a nerve to charge premium pricing with little things like that. I don't want an engineering marvel. I want a goddamn portable workhorse. These new MacBook pros are a classic example of form over function. A touchbar that requires you to look at it to be useful, diverting your eyes and hands from the useful work on the screen and keyboard/touchpad, implemented solely for the purpose of being cool rather than functional. A shallower, butterfly keyboard with poor key travel - an acceptable compromise for a much smaller/lighter device like the MacBook but a horrible sacrifice to the thin/light altar for a pro-level productivity notebook. The removal of genuinely useful features like the Magsafe power adapter, another sacrifice to an arbitrary aesthetic.